STREAM FLOWS OUT OF THE BUILDING AND DOWN A GULLY. THE ROAD NOW SLOPES BACK DOWN THE OTHER SIDE OF THE HILL. THERE IS A BUILDING IN THE DISTANCE. Many a day in the late 70s and early 80s I had read the words above, which told me that I was once again above ground somewhere outside of Colossal Cave. I needed to pick up a lamp, and I would once again be ready to explore. It wasn't until last night that I learned that Colossal Cave had a real-worldTM counterpart as Mammoth Cave, Kentucky. The Digital Humanities Quarterly Summer 2007 article, "Somewhere Nearby is Colossal Cave: Examining Will Crowther's Original “Adventure” in Code and in Kentucky," by Dennis G. Jertz of Seton Hill University sheds new light on an old legend. Colossal Cave Adventure was a text-based computer game that I surreptitiously played on an old mainframe VAX account that I had when I first started work at West Virginia University in 1979. I had to be stealthy because computing resources and storage space was deemed too precious a commodity for such a thing as a non-productive text adventure game. Sysadmins had banned the game and diligently searched out and deleted the executable binary. Fortunately for me, they only looked the the title "ADVENT." I renamed my module to something else. Lord, it was a mighty feeling of accomplishment when I finally completed the adventure! But I didn't do it alone. I had confederates whom I had met in the first computer science class that I took, courtesy of a tuition waiver granted to full-time employees of WVU. Together, we had mapped the legendary labyrinth section of the cave, which alternately consisted of a maze of twisty passages, all alike and a twisty maze of passages, all alike. Those expressions have remained with me all of these years. If I see a glimmer of recognition in the eyes of my listener, then I know that they, too, are an initiate. According to the article, Colossal Cave Adventure was created by Will Crowther. Newly discovered evidence indicates that Crowther wrote the game during the 1975-76 academic year and probably abandoned it in early 1976. Crowther's original source code, which had been presumed lost for decades, was recovered in 2005 from a backup of Don Woods's student account at the Stanford Artificial Intelligence Lab (SAIL). The recovered files, dated March 1977, and bearing the in-game message “WELCOME TO ADVENTURE! !”, confirm that Crowther's original was in fact a game, with puzzles (such as a sequence that involves interactions between a rusty rod, an empty birdcage, a bird, and a snake), subtle humor (such as the surprising way that the bird helps the player get past the snake), and fantasy (including a magical crystal bridge, magic words, and combat with axe-wielding dwarves. Yet Crowther's adventures in Colossal Cave began earlier, via the Cave Research Foundation (CRF). Crowther and his wife, Pat, were spelunkers. According to this article, it was Pat who distinguished herself in the caving community by physically squeezing through a tiny hole that connected two sprawling networks of cavers that were once thought to be separate. Crowther himself worked as a cartographer, and he participated in a survey of "Bedquilt," an area of the Flint Mammoth Cave System / Colossal Cave region. Thank you, Don Huffman, wherever you are. Thanks! I've been looking for this image on the Web for years. I got a copy of the poster from Compuserve in the 1980s but passed it on to a young adventurer. What does the text in the lower right hand corner say? (That might help to find a better image). Can't really see the details well enough, but the map seems to have bits not found in the original 350 points Crowther-Woods version. Is it a map of the 430 point expansion? See http://inventory.getlamp.com/category/interviews/ for a drawing of the 350 point version that was available for purchase from Compuserve. Wow, this looks an awful lot like a map of the long-lost 751-point "New Adventure" by David Long that was on CompuServe in the '80s (not to be confused with the not-lost-at-all 551-point "Adventure 6" by Doug McDonald). If you have anything related to "New Adventure", I'd really really like to hear about it! Original blogger: do you still physically possess this poster? Is it possible for you to photograph it again at high resolution? Replying to this comment will notify me via email, and/or I'm easy to reach at Gmail. 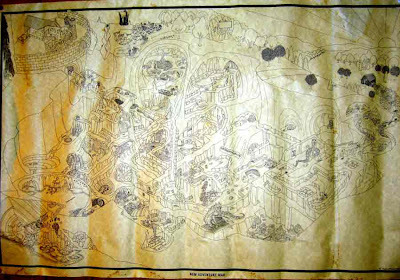 Update: I have (independently) acquired a (different) physical copy of the "New Adventure Map" poster, and 300dpi scans are now available at http://www.club.cc.cmu.edu/~ajo/in-search-of-LONG0751/readme.html .